Fish The Bahamas With The Boys From Gink & Gasoline! That’s right, you can get in on the Gink! Experience the worlds best bonefishing, learn the ropes of saltwater fly fishing and improve your fly fishing photography, all while enjoying the company of the G&G community! For us, the news doesn’t get any bigger. The last year has been amazing! There’s no way I can overstate how pleased Kent and I have both been with the reception that Gink and Gasoline has received from the angling world. We are simply overwhelmed and deeply grateful. Thanks to you all! The best part by far is the quality of our readers. We know from your comments and emails that you are a passionate and inclusive group. We have been amazed to find G&G to be immune to the kind of hateful rhetoric that is so common on the web. You are indeed a classy bunch. We feel like we have discovered a community of like-minded anglers and friends. We want to engage with that community in a new and more personal way, and what better way than a fishing trip! We are excited to announce our first ever Gink and Gasoline fishing trip. We have set aside the week of January 26th thru February 2nd to host ten anglers at the Andros South Bonefish Lodge. We are committed to making this a hosted trip like no other. In addition to the world’s best bonefishing, beautiful Bahamian flats and awesome food and drink, we will be teaching a bonefish 101 primer, fly tying clinic and I will conduct a fly fishing photography workshop for the shutterbugs. The focus is on fun and fishing. This is a great trip for anglers of all skill levels. Newbies will learn the ins and outs of bonefishing and experienced anglers will get a shot at the biggest bones the Bahamas has to offer. No egos and no attitudes. Just good times and great fishing. Here are a few of the reasons you don’t want to miss this trip! South Andros is hands down my favorite place to fish. I have never had a bad day. 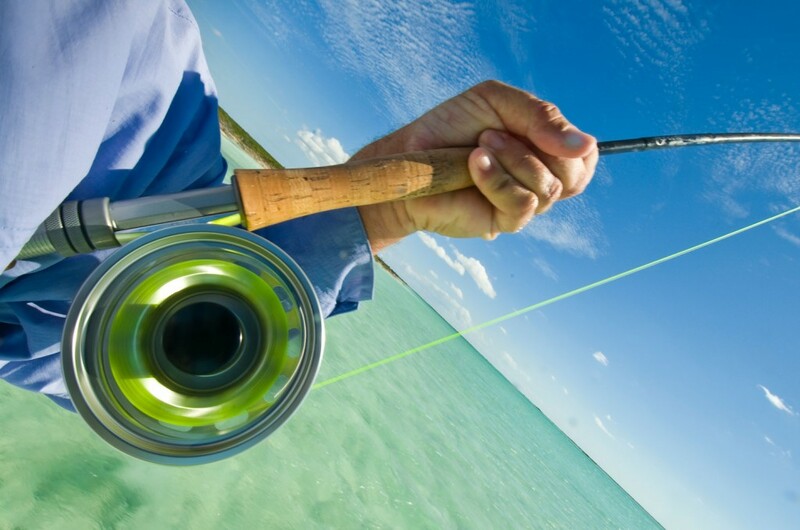 There is no better place to learn the skills needed for successful saltwater fly fishing. If you’re new to the salt you can take advantage of the abundance of eager bonefish to dramatically shorten the learning curve for skills like strip setting, fish spotting, making successful presentations and quick casting. The guides at Andros South are the best on the island. Most of them have been with the lodge for over ten years. They know the water and they know how to put anyone on bonefish. Want to learn to tie bonefish flies, work on your casting, take photos like a pro, make a great cocktail? All of the above? Kent and I will do our best to share what we know and help you meet your goals. Andros South provides a great experience for all. The atmosphere is relaxed and friendly. The food is great and the bar is well stocked and it’s all included in the price. That’s right, no paying for drinks and the bar is open 24/7. The staff is friendly, knowledgeable and accommodating. You step off the boat and hand your gear off to Vado, the driver, and it’s washed, transported and put back in your hand the next morning ready to fish. Rooms are single occupancy, there’s wifi and a Skype phone to call home. You will not want to leave. Six days of fishing and seven nights of fun plus all you can eat and drink and the extra workshops for $4375. That’s hard to beat. I probably save close to a grand on the bar tab alone. We see it as our job to live the dream and share it with our fans. Well, isn’t it about time you got in on the fun? Don’t just read about the adventure, live it and let us help. We want to see your smiling face on Gink and Gasoline! G&G followers are a great bunch of guys! Whether it’s sharing a day on a skiff or hanging out at the tiki hut with a drink in your hand and your toes in the sand, odds are you will be in fine company. Many of the guys I fish with regularly and now call my good friends, I met at Andros South. I can not measure the richness these good people have added to my life. I hope you will be one of them. So How Do I Get In On The Fun? I’m glad you asked. Just email us at hookups@ginkandgasoline.com and we will be happy to answer any question and get you all the info you need to get booked. I can’t wait to see you in the Bahamas! This entry was posted in Fly Fishing, Fly Fishing Lifestyle, Fly Fishing News and tagged Andros South, bonefish, fishing, fly fish bahamas, Fly Fishing, fly fishing lessons, Fly Fishing Photography, Gink and Gasoline, Gink and Gasoline bahamas trip, how to fly fish, Kent Klewein, learn to fly fish, Louis Cahill, permit, photography, salt water fly fishing, tarpon by conan. Bookmark the permalink. We’re glad we can help you out with your wishlist, Ha. For Sale: ’73 Chevy K10 with a fuel injected 427ci big block, lift, custom VDO cockpit gauges, BMW seats, Big Boy trans and NP205 transfer case, lots of extras. Provide us a link for a photo of it. I’d do it for the lodging and photography workshop alone. I’d also take a fish or two. One day. Y’all have fun. Good to hear from you man. You and I need to get on the Toccoa. I didn’t know it was so close to your heart. Let’s do it late fall when the bite is better. Sounds like a plan, Kent. Looking forward to it. Pingback: Saturday Shoutout / Skiff Republic | Gink and Gasoline, The Blog home of Kent Klewein and Louis Cahill-Fly Fishing photography, video, tips and news. Pingback: Slowing Down and Casting Easier Can Improve Your Fly Cast | Gink and Gasoline, The Blog home of Kent Klewein and Louis Cahill-Fly Fishing photography, video, tips and news. Pingback: Use a Dehumidifier to Keep Your Fly Fishing Gear Dry and Fresh | Gink and Gasoline, The Blog home of Kent Klewein and Louis Cahill-Fly Fishing photography, video, tips and news. Pingback: The Smithfly Modular Fishing Pack | Gink and Gasoline, The Blog home of Kent Klewein and Louis Cahill-Fly Fishing photography, video, tips and news. Pingback: Saturday's Shoutout / Planet Trout & Small Fly Funk | Gink and Gasoline, The Blog home of Kent Klewein and Louis Cahill-Fly Fishing photography, video, tips and news. Pingback: Sunday's Classic / The Trifecta for Fishing Solitude | Gink and Gasoline, The Blog home of Kent Klewein and Louis Cahill-Fly Fishing photography, video, tips and news. Pingback: Don't Just Love Your Cold Water Fisheries, Be Good Stewards Also | Gink and Gasoline, The Blog home of Kent Klewein and Louis Cahill-Fly Fishing photography, video, tips and news. Pingback: Hyperfocal Focus | Gink and Gasoline, The Blog home of Kent Klewein and Louis Cahill-Fly Fishing photography, video, tips and news. Pingback: The Bauer Rogue Classic, Made for Spey | Gink and Gasoline, The Blog home of Kent Klewein and Louis Cahill-Fly Fishing photography, video, tips and news. Pingback: How to Keep Your Polarized Sunglasses Like Brand New | Gink and Gasoline, The Blog home of Kent Klewein and Louis Cahill-Fly Fishing photography, video, tips and news. Pingback: S.C.O.F. And Bonefishing | Gink and Gasoline, The Blog home of Kent Klewein and Louis Cahill-Fly Fishing photography, video, tips and news. Pingback: Sunday Classic / Fish Boy Is Sorry | Gink and Gasoline, The Blog home of Kent Klewein and Louis Cahill-Fly Fishing photography, video, tips and news. Pingback: Checking Your Attitude | Gink and Gasoline, The Blog home of Kent Klewein and Louis Cahill-Fly Fishing photography, video, tips and news. Pingback: 6 Tips for Catching Suspended Trout | Gink and Gasoline, The Blog home of Kent Klewein and Louis Cahill-Fly Fishing photography, video, tips and news. Pingback: Fill Flash For Cooler Photos | Gink and Gasoline, The Blog home of Kent Klewein and Louis Cahill-Fly Fishing photography, video, tips and news. If anyone would like to buy $4,375.00 in prepaid legal services in Bozeman, Montana, I would certainly not object. I’ll need a thaw about the end of January after fishing streamers and midge nymphs in the snow until then. Two new inches of the white stuff this morning. Somebody is about to get sued! Pingback: Streamer Tactics for Small Trout Water | Gink and Gasoline, The Blog home of Kent Klewein and Louis Cahill-Fly Fishing photography, video, tips and news. Pingback: The Vedavoo Tight Lines Swing Pack | Gink and Gasoline, The Blog home of Kent Klewein and Louis Cahill-Fly Fishing photography, video, tips and news. Pingback: Saturday's Shoutout / Weekend Fly Fishing Reads | Gink and Gasoline, The Blog home of Kent Klewein and Louis Cahill-Fly Fishing photography, video, tips and news. Pingback: Sunday's Classic / Getting Better Shots of your Trophies | Gink and Gasoline, The Blog home of Kent Klewein and Louis Cahill-Fly Fishing photography, video, tips and news. Pingback: Don't Be a Sleep at the Wheel When Fishing Egg Patterns | Gink and Gasoline, The Blog home of Kent Klewein and Louis Cahill-Fly Fishing photography, video, tips and news. Pingback: 30 Days in True Flies Clothing | Gink and Gasoline, The Blog home of Kent Klewein and Louis Cahill-Fly Fishing photography, video, tips and news. Pingback: Keep a Backup Nymph Rig Ready | Gink and Gasoline, The Blog home of Kent Klewein and Louis Cahill-Fly Fishing photography, video, tips and news. Pingback: The Fishpond Westwater Collection | Gink and Gasoline, The Blog home of Kent Klewein and Louis Cahill-Fly Fishing photography, video, tips and news. Pingback: Saturday Shoutout / Off Topic Journeys | Gink and Gasoline, The Blog home of Kent Klewein and Louis Cahill-Fly Fishing photography, video, tips and news. Pingback: Sunday Classic / What the Hell is That? | Gink and Gasoline, The Blog home of Kent Klewein and Louis Cahill-Fly Fishing photography, video, tips and news. Pingback: Tiger Trout | Gink and Gasoline, The Blog home of Kent Klewein and Louis Cahill-Fly Fishing photography, video, tips and news. Pingback: Stocked Brook Trout - Strip it, Skate it, Swing it | Gink and Gasoline, The Blog home of Kent Klewein and Louis Cahill-Fly Fishing photography, video, tips and news. Pingback: The Redfish Wiggler | Gink and Gasoline, The Blog home of Kent Klewein and Louis Cahill-Fly Fishing photography, video, tips and news. Pingback: Nautilus Reels - New Reel Designs and Factory Expansion | Gink and Gasoline, The Blog home of Kent Klewein and Louis Cahill-Fly Fishing photography, video, tips and news. Pingback: Sunday's Classic / Split-Shot Placement For Tandem Nymph Rigs | Gink and Gasoline, The Blog home of Kent Klewein and Louis Cahill-Fly Fishing photography, video, tips and news. Pingback: Don't Tread on my Redd | Gink and Gasoline, The Blog home of Kent Klewein and Louis Cahill-Fly Fishing photography, video, tips and news. Pingback: The Best Way to Improve Your Trout Game | Gink and Gasoline, The Blog home of Kent Klewein and Louis Cahill-Fly Fishing photography, video, tips and news. Pingback: New Products From Sage for 2013 | Gink and Gasoline, The Blog home of Kent Klewein and Louis Cahill-Fly Fishing photography, video, tips and news. Pingback: Saturday Shoutout / Mikes Gone Fishing | Gink and Gasoline, The Blog home of Kent Klewein and Louis Cahill-Fly Fishing photography, video, tips and news. Pingback: Sunday Classic / South Andros, A Love Story | Gink and Gasoline, The Blog home of Kent Klewein and Louis Cahill-Fly Fishing photography, video, tips and news. Pingback: Listen to the Fish | Gink and Gasoline, The Blog home of Kent Klewein and Louis Cahill-Fly Fishing photography, video, tips and news. Pingback: The Bowen's Baitfish Minnow | Gink and Gasoline, The Blog home of Kent Klewein and Louis Cahill-Fly Fishing photography, video, tips and news. Pingback: Look More and Fish Less on Small Streams | Gink and Gasoline, The Blog home of Kent Klewein and Louis Cahill-Fly Fishing photography, video, tips and news. Pingback: Howler Brothers Clothing | Gink and Gasoline, The Blog home of Kent Klewein and Louis Cahill-Fly Fishing photography, video, tips and news. Pingback: Saturday Shoutout / Hank Patterson Fly Fishing Videos 1-3 | Gink and Gasoline, The Blog home of Kent Klewein and Louis Cahill-Fly Fishing photography, video, tips and news. Pingback: Sunday's Classic / Pheasant Tail Nymph Attractor | Gink and Gasoline, The Blog home of Kent Klewein and Louis Cahill-Fly Fishing photography, video, tips and news. Pingback: Omar | Gink and Gasoline, The Blog home of Kent Klewein and Louis Cahill-Fly Fishing photography, video, tips and news. Pingback: Rob Smith's Musky Sucker | Gink and Gasoline, The Blog home of Kent Klewein and Louis Cahill-Fly Fishing photography, video, tips and news. Pingback: Fly Fishing Bass Ponds 102 | Gink and Gasoline, The Blog home of Kent Klewein and Louis Cahill-Fly Fishing photography, video, tips and news. Pingback: Stormr Extreme Outerwear | Gink and Gasoline, The Blog home of Kent Klewein and Louis Cahill-Fly Fishing photography, video, tips and news.